Poverty continues to impact 1 in 5 North Carolinians, according to 2012 Census Bureau Data released last week. The extent of poverty would be far greater without the safety net and work supports, however. This post is part of a blog series that will explain how the new poverty data demonstrates the important role public programs play and the need for continued support. See our posts on the Supplemental Nutrition Assistance Program and Social Security. The failure of the official recovery to create jobs and especially jobs that pay above poverty wages is driving persistently high poverty rates. The latest Census data confirm that North Carolina’s high unemployment rate and persistent job deficit is driving significant hardship. As jobless workers continue to outnumber job openings by nearly 3 to 1, unemployment insurance plays a critical role in minimizing the downward spiral of massive job losses in an economy. In 2012, the latest Census data finds that unemployment insurance lifted 1.7 million people out of poverty. 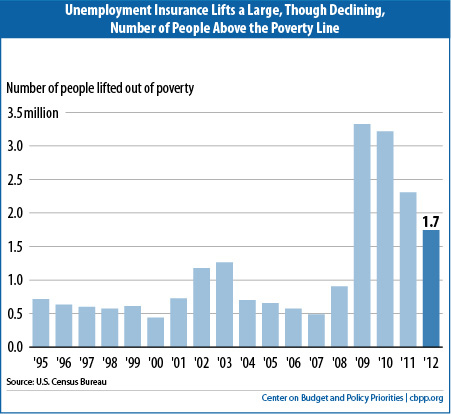 While impressive, as is clear from this graph by the Center on Budget and Policy Priorities, the anti-poverty power of unemployment insurance is eroding. In part, this erosion is due to jobless workers finding jobs. But an equally important explanation is the decline in the number of jobless workers who receive unemployment insurance benefits. The number of jobless workers who receive no state or federal unemployment insurance is now higher than at the bottom of the recession. And that picture is only likely to worsen in the coming year. Congress had already reduced the number of weeks of federal UI benefits for the long-term unemployed in 2012. But in 2013 North Carolina’s General Assembly rejected any additional weeks paid for by the federal government. That is likely to result in an estimated 170,000 North Carolinians losing unemployment insurance benefits in 2013. In addition, significant state-level changes to unemployment insurance benefits were made that will further reduce access, amounts and duration of unemployment insurance, impacting North Carolina’s jobless workers and local communities. The intent of unemployment insurance to protect the economy from the shock of massive job losses has been undermined. With it, many more North Carolinians are likely to experience economic hardship and the strength of the state’s economic recovery will continue to flag. My benefits will be running out in just 4 weeks and I still can not find employment in Wilmington, NC. I have applied for every possible type of job one can imagine. I think that the labor laws in the state are designed to only protect employers and are not in the best interest of the employee. I lost my job back in 2012 due to circumstances that were extremely unfair and being terminated has made my job search near impossible. I have rarely been called for interviews and it is my belief that my previous employer is giving me a bad reference. I thought it was illegal to do that in this state but apparently it is not. @Crystal, it is my understanding that interviewers are only allowed to ask previous employers if you actually worked there. Unless you listed someone from your last company as a reference, this shouldn’t really be an issue. Good luck with with your job search. NC is ruthless for the unemployed! My benefits will be running out in just 3 weeks and I still can not find employment anywhere in the entire US due to my age. I am 55 and in very good health but no one will respond.I have worked all my life without having to draw unemployment. I have lost all my vehicle’s, had to pawn everything I own that was not a item I needed to live, to include me and the wife’s wedding rings. I am a veteran but not disabled. I am very frustrated trying to find work to support my family. I will keep looking for 3 more weeks and if I don’t fine suitable work I will be forced into drawing Welfare. The new extended benefits law will force many people here in NC into poverty.